Within the SQL Server world we tend to use tools such as raw SQL or MDX code, Excel, DAX in Power Pivot and may be even the M language in Power Query to do most of our data analysis work. Outside of these Microsoft orientated tools we may even use the R language which despite being around for a very long time is only now being recognised within the SQL Server business intelligence community. In this post I want to mention another data analysis tool which is feature rich, has a large user base (as a result of its parent language) and which can be used to bridge the gap between the Windows and SQL Server world and the other worlds which include technologies such as NoSQL. The data analysis tool that I’m referring to is the pandas module used within the Python language. As is the case for R the Python language has a very large user base. The Python pandas module provides the DataFrame object which is analogous to the same object in R. SQL type operations such as join, merge, group by, pivot can all be performed on pandas DataFrames. I’ll illustrate the use of the pandas module using some very simple examples. I’m using the freely available Anaconda Python 2.7 (64 bit) distribution on Windows. You can obtain this from https://store.continuum.io/cshop/anaconda/. I’m using the interactive IPython qtconsole to run all the code. 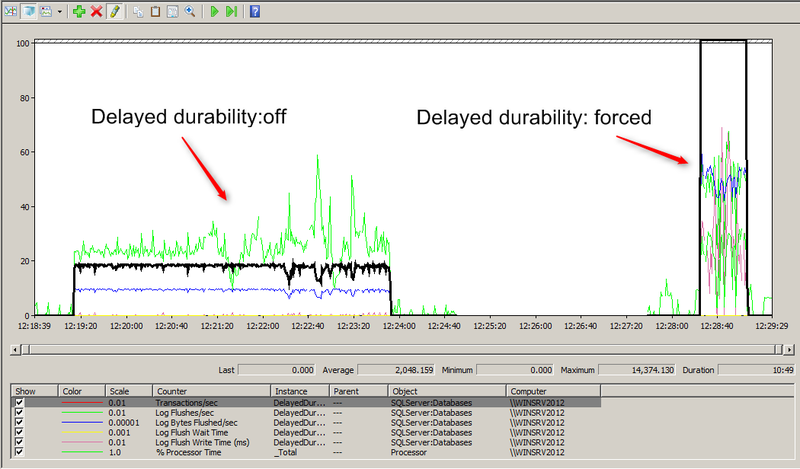 The actual execution above fetches data from an historical waitstats table. This table stores the waitstats in their raw form. That is, just like the DMV that they are sourced from the counts and times are cumulative figures since the start time of the SQL Server. The head command is used to show the first 10 rows of the dataframe. The first column (showing 0 to 9) represents the default index for the dataframe. After the sort I create a multi-index on wait_type and sampletime. I show the use of an index fetch using ix to select out one of the wait types. You can see that with the assignment statement I’m overwriting the original waitstats dataframe that held the cumulative figures with the results of the groupby holding just the deltas. The dropna command is used to remove the NaN rows. The content assumes very little previous knowledge of Python. Prior to dipping into this reference I myself knew hardly any of the language constructs yet I’m now able to understand many of the questions that arise on forums such as StackOverflow. The first result set is from the file table. 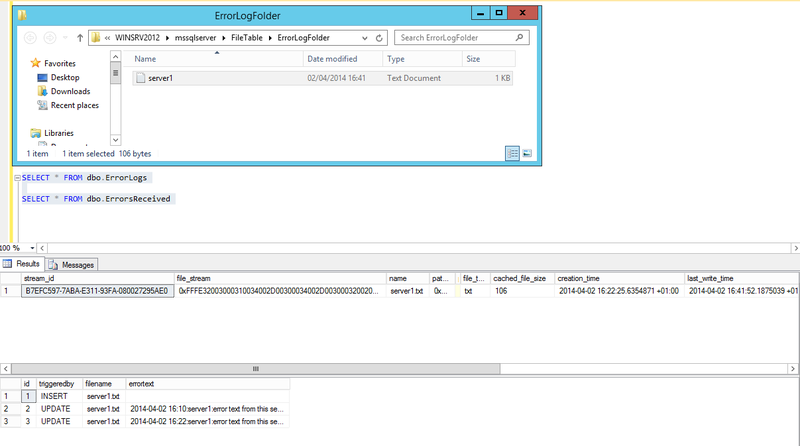 You can see the file name, its type and size and the file_stream column that contains the actual data. The data for the second result set comes from the firing of the triggers. 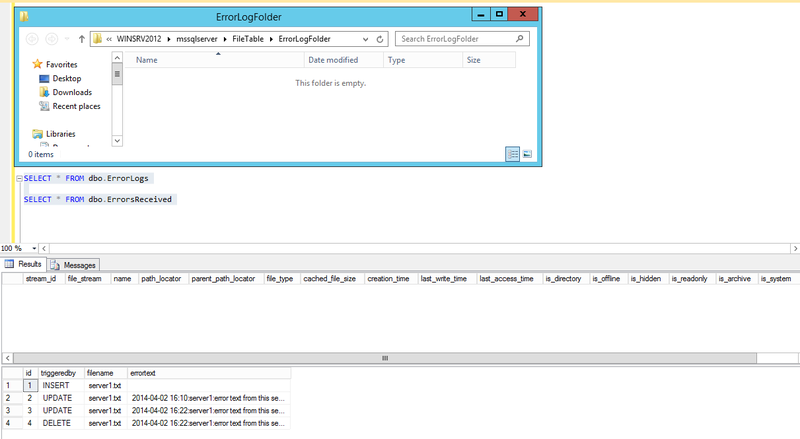 You can see that the file copy operation is captured as an insert followed by an update. See the doubling of the cached_file_size and the file_stream column with its 0xFFFE header indicating UNICODE as well as the interleaved 00 in the double byte character representation. The trigger code uses the 0xFFFE to determine whether the file_stream data is unicode or not and does the appropriate conversion before saving to the unicode column in the ErrorsReceived table. You see the file table is now empty and the delete trigger fired to save its results. 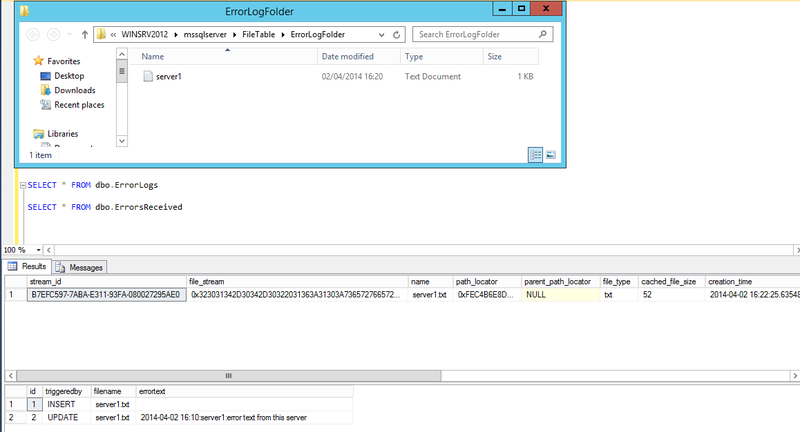 In summary, these simple tests shows that you can implement a file watcher using the file table functionality. Triggers can be created against the file table and the file content residing in the file_stream column can be parsed for further processing.